The Animal Medical Care Foundation (AMCF) have once again brought a big smile to our faces at ERF when we recently received a parcel of donated medical products from them. 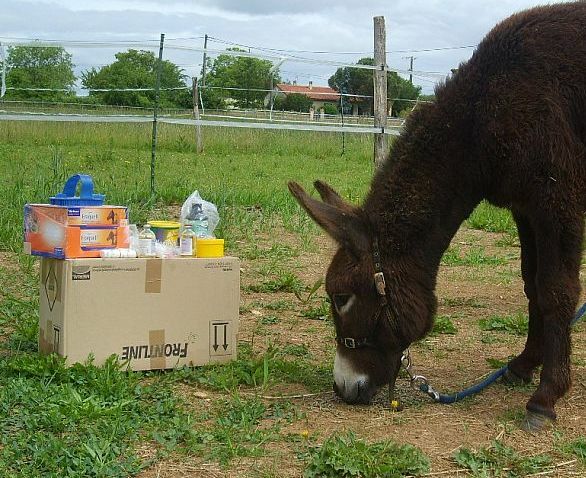 The wormers, antibiotics, grooming products and other useful equine items are much appreciated as it means we can use what little finances we have elsewhere in continuing to help those equines that need us most. We are always very grateful to receive any unwanted but useable equine equipment or products. Headcollars and leadropes of all sizes are particularly useful, so if you have any laying about that you no longer use, please think of ERF. ERF Vinnie checking out the latest parcel from AMCF...think he approves!